No, no, Your Humble Webmaster has not accidentally duplicated the October 2010 section of the Gallery. No, what has happened is that Big Tractor Mike once again swooped in like a hawk, gathering regular cars up for a children’s Christmas event with which he is involved, offering credit for his booty (no, I mean the cars). 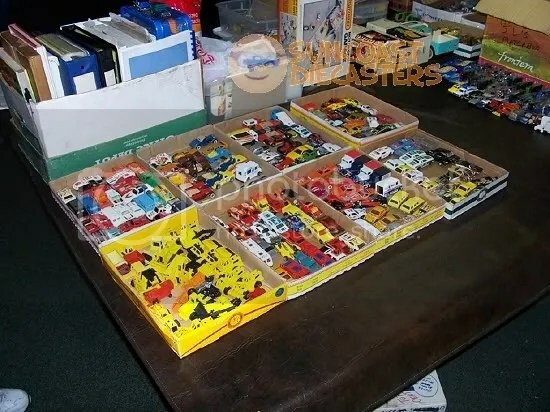 I had noticed that this set sat unattended since he bought from me, so I asked for it back as part of the credit swap, to which he readily agreed. Classic 24-count collector case. This is also part of The Great Christmas Credit Swap with BTM. 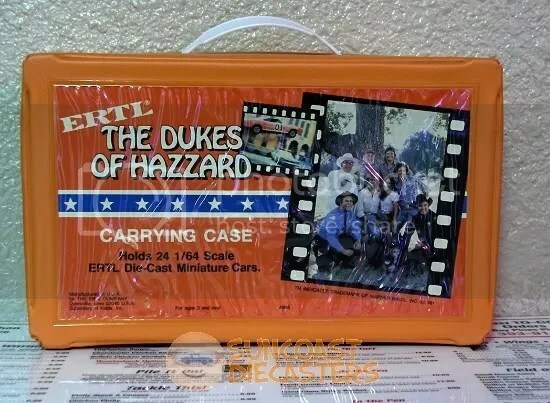 I chose it not because it’s a Dukes of Hazzard item (got over that long ago) but because it’s Ertl-branded — I didn’t Ertl made cases! — and because it’s storage. 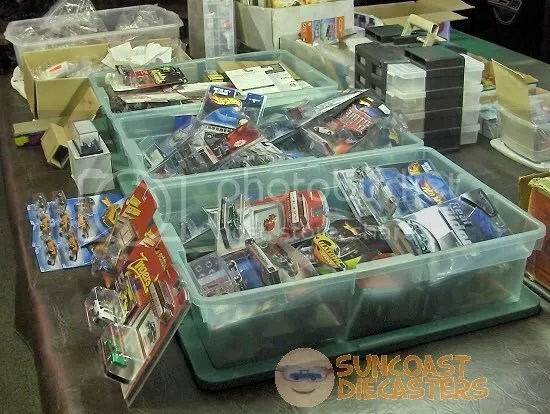 And if there’s one common need among all collectors, it’s storage! I believe (I think) (I hope) that I still have my original Batmobile and Batboat (with trailer! 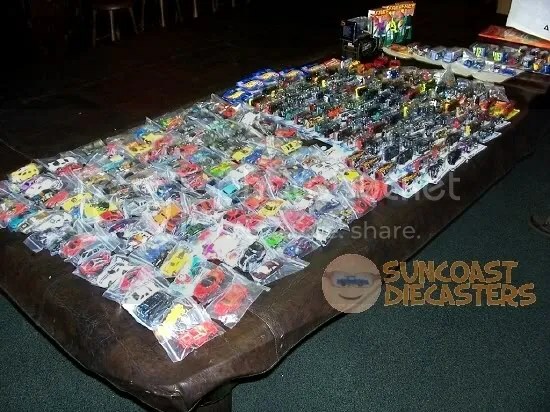 ), so this Batcopter (BTM swap) would give me a (more) complete set. Unless I don’t have them anymore, which would be sad. 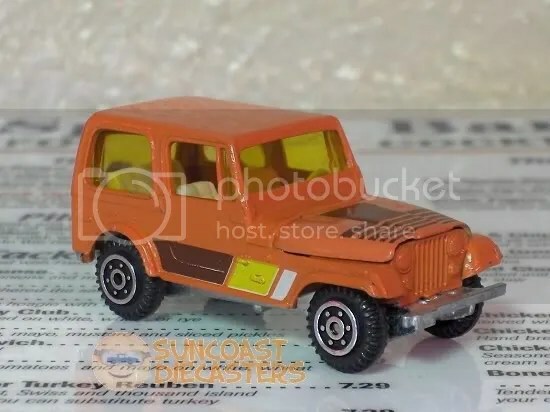 Jeep CJ-7 by Yatming, courtesy BTM (yep, swap). Real nice casting. Sporty engine, too; it’s just too bad the hood won’t stay up on its own, or there’d be a photo of it. 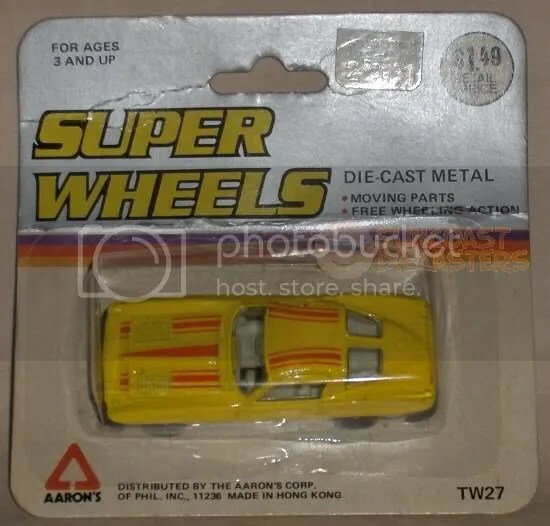 Camaro, By Jet Wheel, courtesy BTM (swap). Jet Wheel’s brief history is nicely summarized by Breithaupt & Mueller at this page. 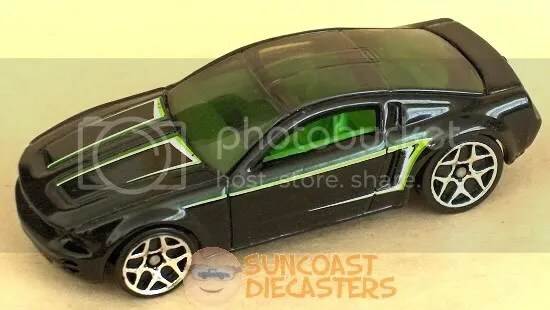 Jet Wheels models are, judging by this Camaro, well-designed: good castings and coloring, good interiors, good wheels. 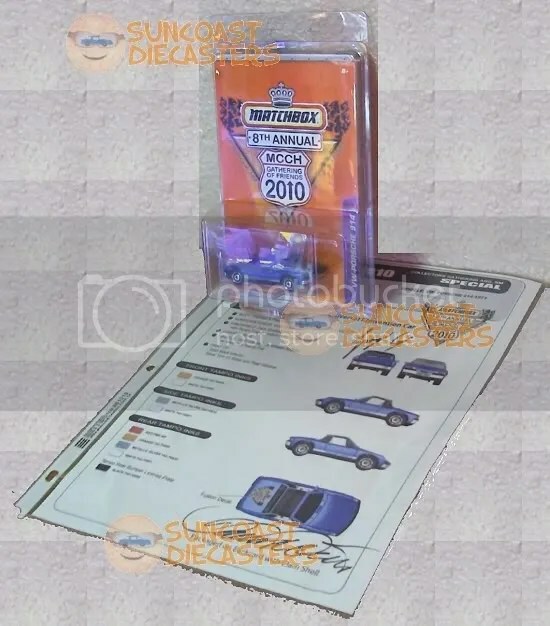 I can only presume that their very clunky packaging may have been a key element in their failure to capture marketshare from Hot Wheels. 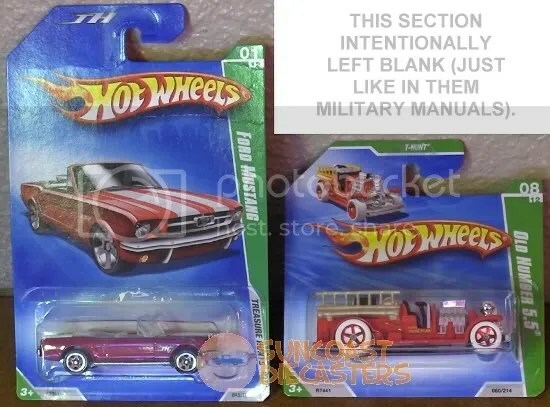 JWs came in hard, bulky plastic shells with rather bland cardboard backers, and the cars were secured into the shells by over-engineered plastic widgets. Contrast this to HW’s thin-wall blisters and Otto Kuhni’s “high impact” illustration — definiely a marketing winner. 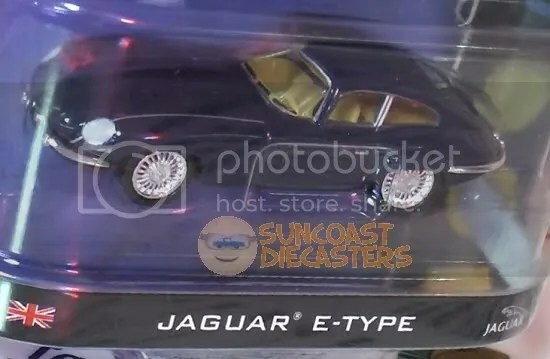 Jaguar E-Type, by Playart. I had ROAK’d Ken with this after the end of the Nov metting. Yeah, after: I was loading my stuff back into my truck when I remembered it. Didn’t occur to me then to unpack the camera and take a shot of it for the November update. Duh. Ken obtained this incredibly well-detailed trashenheimer from … someplace. I have come to the uninformed opinion that it’s meant for scale railroad hobbyists; it’s simply far too detailed for its size to be for “static display” modellers. Ken also acquired this Isuzu VWR 340 by Grip Zechin. 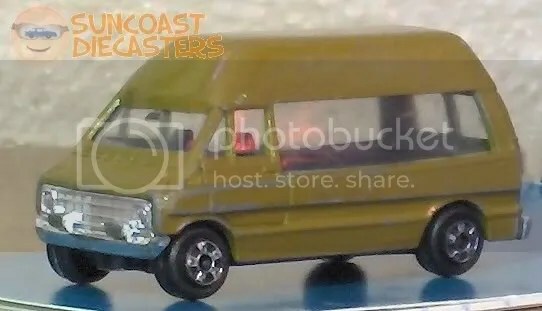 The base claims it to be 1/100 scale — that’s a nice round humber. This is the Fast111s Mighty Mule, which I was very happy to get from Ken. Yes, another fine rare Kenner model added to my … uh … Oh, wait, that’s right: this one isn’t mine. It’s Ken’s. Yes, it’s coming back to me now … Ken showed me this wonderful Fast111s I hadn’t seen before … and he kept it. Yes, doctor, I’m seeing it all very clearly now…. Same thing with the Jag and this TH Impala. I’ll have to consider this approach for future shots. …No, it’s not Racing Champions or any other modern, well-known brand. 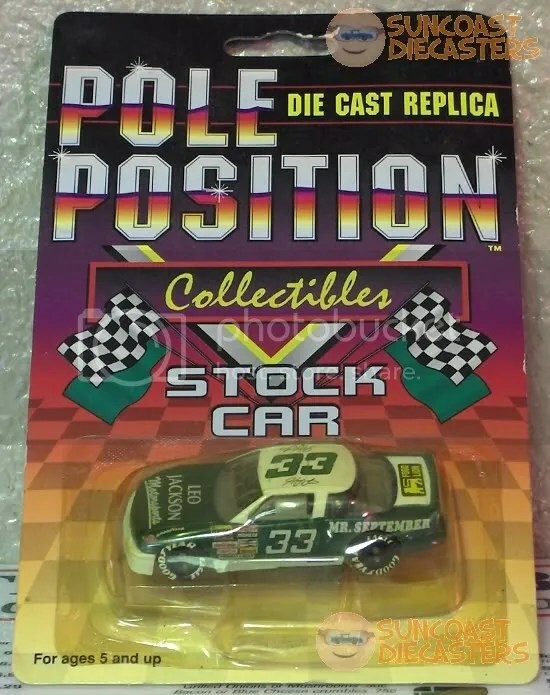 It’s Pole Position, a brand from an outfit called Mountain Service International, Inc.
Well, looks like Ken goes all upper-class and snooty here! Check out the ritzy hubs, and the mostly-legible Speedster tampo. The front & rear bumpers are nicely detailed, as well. 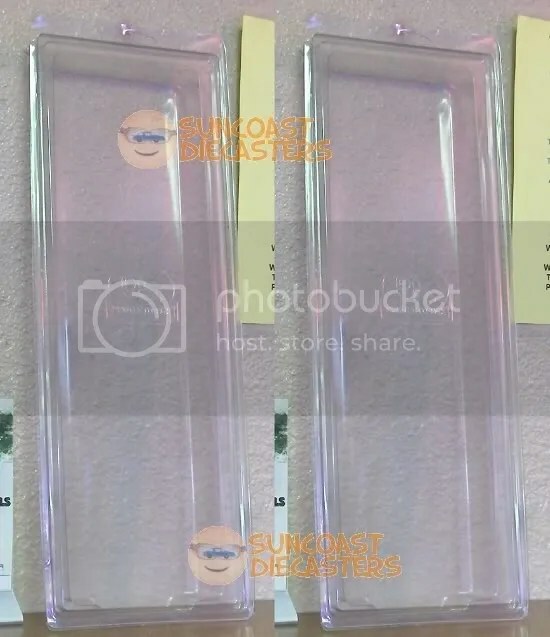 I only wish I didn’t have to shoot through the plastic; however, the model is hermetically sealed to prevent Ken’s enjoyment. So, whaddya think? 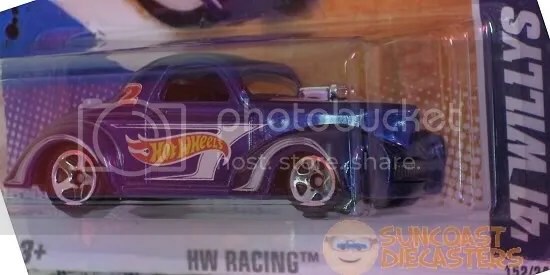 100% Hot Wheels? 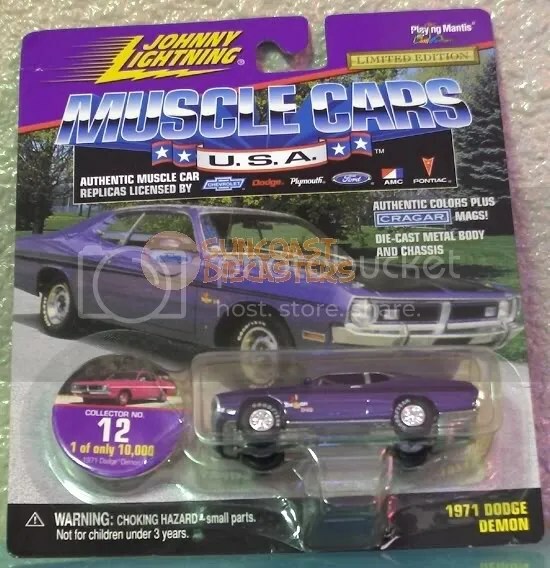 ; Johnny Lightning? ; Greenlight, perhaps? 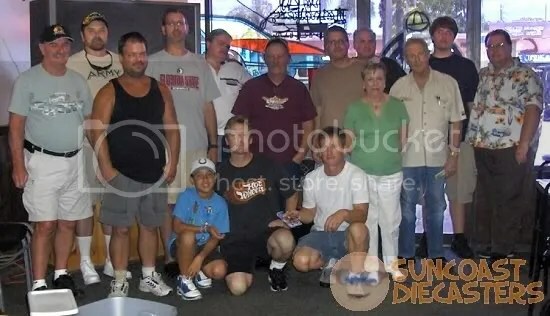 Nope; it’s by Reel Rides, a division of Malibu International. It’s based on the model Kelly McGillis drove in the movie Top Gun. “I feel the need … The need for–” …uh …aw, forget it. Very cool Chevy Blazer, by Yatming, courtesy Marge. Not sure what year the model represents (no data on the base), but it’s clearly from the late ’60s – early ’70s range. A very nice model. By the way, take a second look at the doors — couldn’t tell at first glance that they open, could ya? Yep, the doors are machined that precisely! 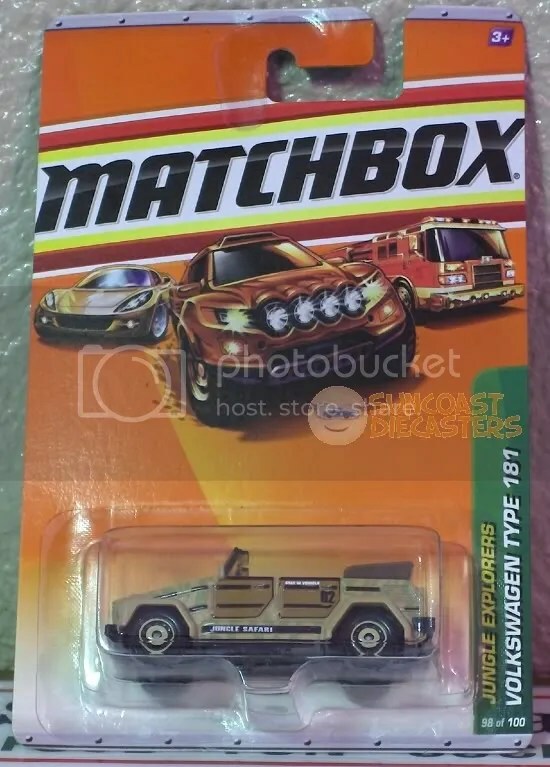 …When was the last time you saw an opening trunk on a 1/64? Outside of the “high end” lines, I haven’t seen this since Hot Wheels’ Sweet 16. The ’56 Ford p/up looks all business with the black-&-forest livery. But there seems to be some serious power under the hood. And check out them sporty hubs! I’m riveted by the attention to detail here. 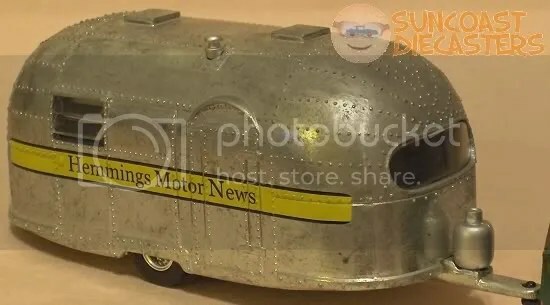 The awning windows, the propane tank… The casual observer might say, “Okay, you’ve added a clunky gray trailer to your collection”; I simply cannot put into words how wonderfully cool this is. 1949 Airstream Clipper. Man, how much yummier is my already awesome collection today! 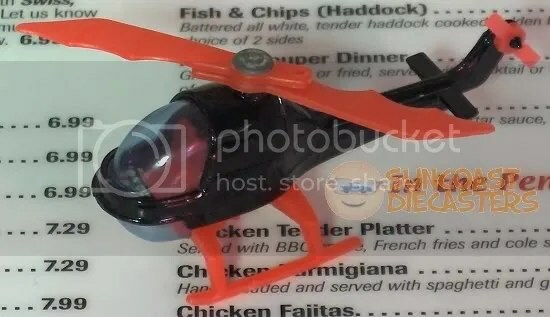 Hey, since it’s made in China, can we call this the China Clipper? Heh-heh. See, ‘coz the … I mean, it says right there… Say, let me distract you by pointing out the groovy hub on that wheel while I scoot out of firing range. 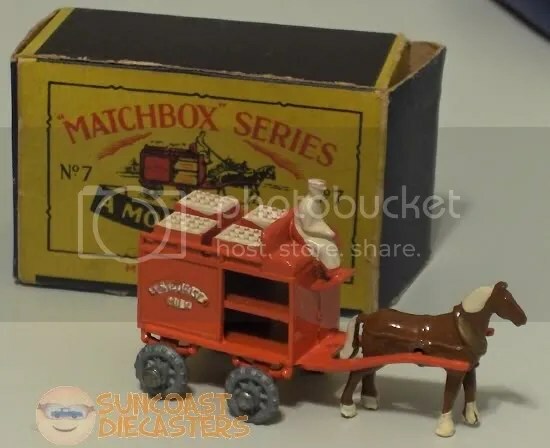 Big Tractor Mike scored this retro vintage set from Your Humble Webmaster. A nice — if cheezy — assortment from Summer, which I picked up at a gift store. (And when I say gift store, I mean a store which takes in other stores’ unsold stuff and tries again to sell it.) 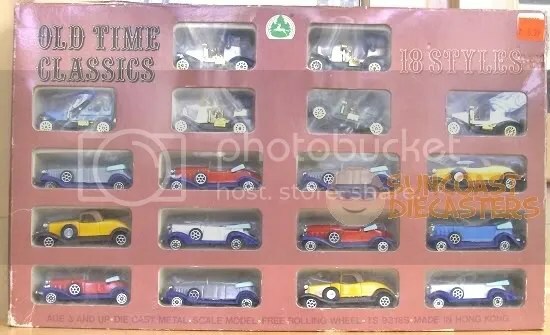 By the way, ya notice how the box says “18 styles”? Nah; there’s about 5. Look closely and you’ll see 3 yellow cars, all the same; 3 red cars, all the same … you get what I’m sayin’. 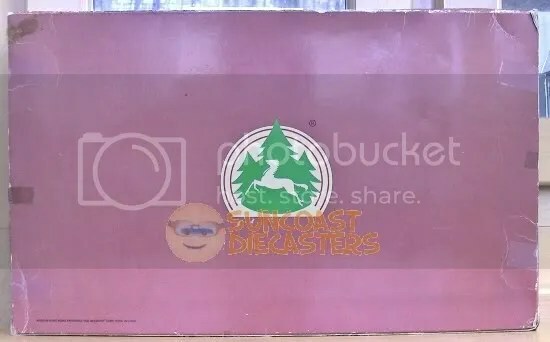 Oddly, the box doesn’t say Summer on it anywhere; yet they put this ginormous logo on the back. I have Summer models that say nothing (except maybe Made in China); I have 2 (that I know of) that actually say Summer; I think I have 1 that says “S.M.” (for Summer Metal). And I even have 1, the Lola, that actually has the rare “Leaping Horse” logo. For those of you who have never seen this logo, here’s a real nice photo of it for you to enjoy. T-Hunts and rarities, and stuff like that there! From our continuing Safely at Home series: these lovely little items were in want of earnest ownership while resting upon the tables at our October meeting. Now they are safely at home…with Frank. 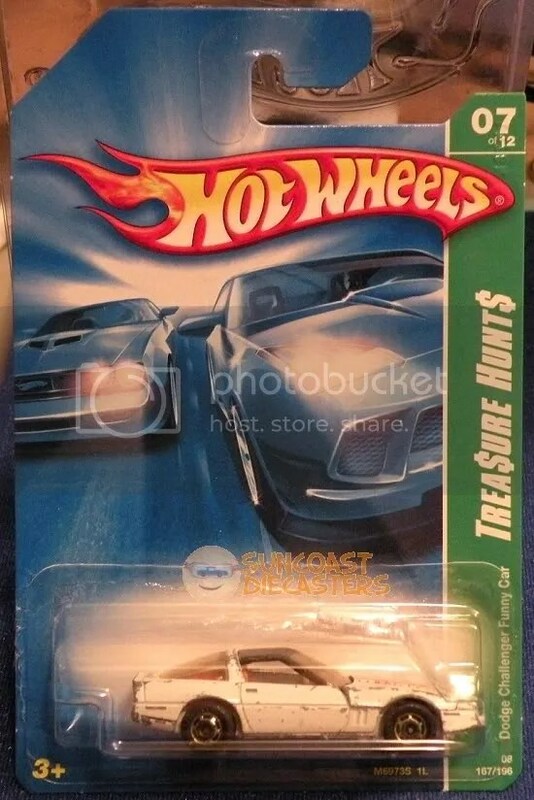 From Frank’s collection: there are Treasure Hunts; there are Super Treasure Hunts … And then there’s this: the rarest of the rare. I don’t know how Frank acquired this one, and I’m scared to ask how much he paid for it. This kind of rare jewel only comes along once in a collector’s lifetime. There’s a rumor floating around the Internet that “a second one has been seen in Astoria”, but I give it no credence. I personally held this one in my hands, and as far as I’m concerned this is the only one proven to be in existence. Testing the fundamentals of the RGB color scheme, Mike C. picked up this trio of classics from the 1930s era. Yep, even the Datsun is from that era. Yep. Mike C. also grabbed this stylish carrying case, courtesy Marge. 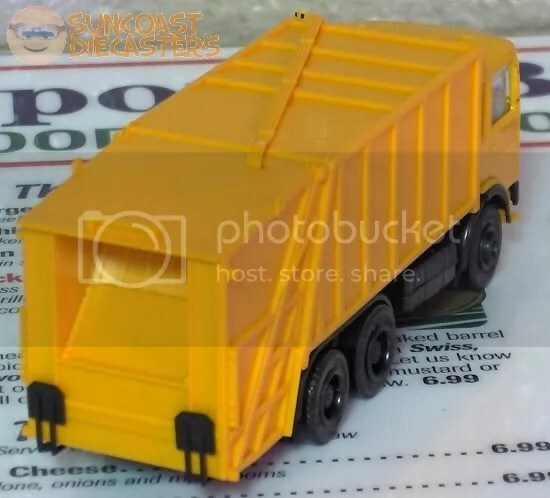 Once again, Ken managed to come away with more garbage trucks; I believe these are by PlayArt. And, yes, you do see that I shamelessly used the beach van to hold up the hopper door. Ken willy did well, adding these willy nice, willy colorful cars to his collection, which I understand is willy growing by leaps and bounds. 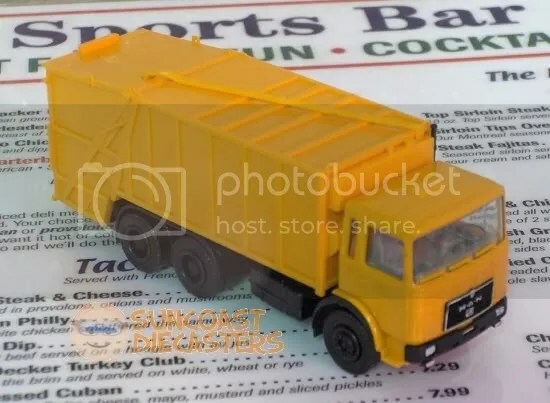 Once again, Ken manages to come awy with more garbage trucks. Except, if you look closely, the green one is a recycle truck. Your’re slippin’, Ken! They don’t make ’em like this anymore. I mean, literally. 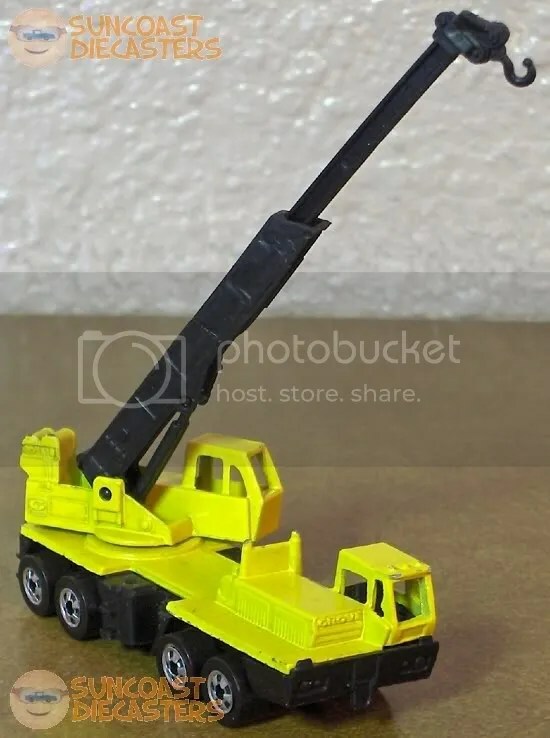 This is the 1982 Construction Crane, courtesy Ken. 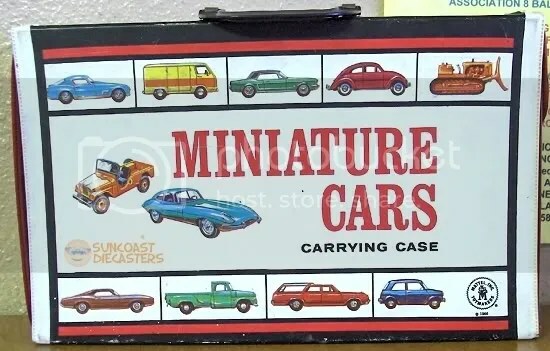 And, no, it’s not a Yatming, or a Corgi, or even a Matchbox. 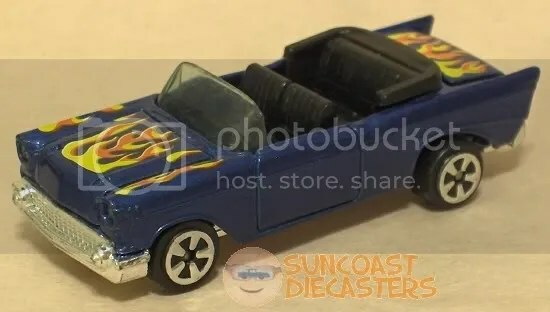 It’s a Hot Wheels. That’s right, Hot Wheels. 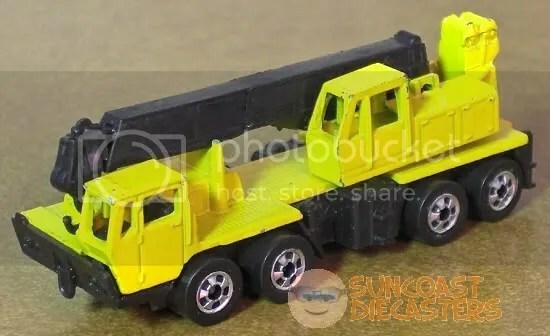 Yes, there was a time (less than 30 years ago, in fact) when HW made richly-detailed construction vehicles. What, you don’t believe me? Okay, fine. Bonus image: I picked up a few new cars recently, one of which included a key chain fob featuring the picture below. Apparently it’s also a game, the goal of which seems to be to locate the Twin Mill III in the picture. Careful, it’s not as easy as it looks. 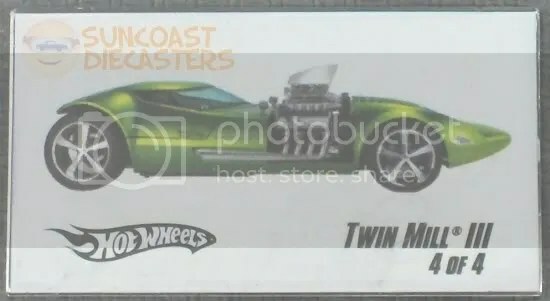 Remember, you’re looking for the Twin Mill III. Take your time…. Here’s our wonderful motley crew; one big happy, 1/64th, blackwall, redline, transitional-wheel family. (Um, except for Big Tractor Mike, who after pushing the release on his cell-phone camera couldn’t run fast enough to join us before the shutter closed.) It’s been five great years, folks, and Your Humble Webmaster thanks you all very much! BTM swooped down like a hawk and grabbeded up a bunch of cars from my table. When the dust settled, he counted ’em up and considered ’em credit. 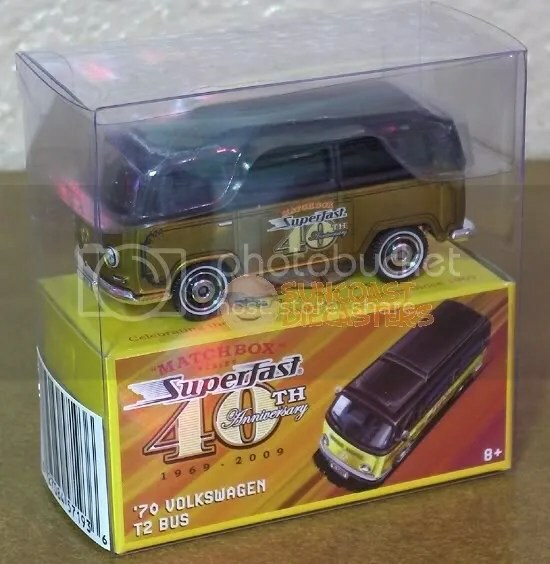 One of the items I got is this Superfast 40th Anniversary VW T2, which was only available as a mail-in promo. SWEET! But, how do I store it…? Ah, well, I’ll tend to that later. 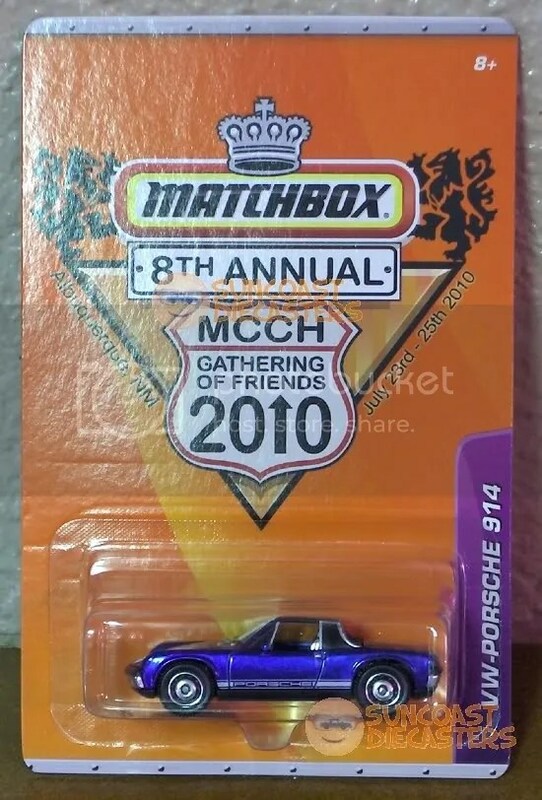 The other item I done got is this extremely limited-edition Porsche, done up in special MCCH Gathering of Friends packaging. Most Excellent! An egineering feat! How do I know? Well, here’s the engineering sheet (or E-sheet) which goes along with it. Further, it’s autographed by two members of the Mattel design team! 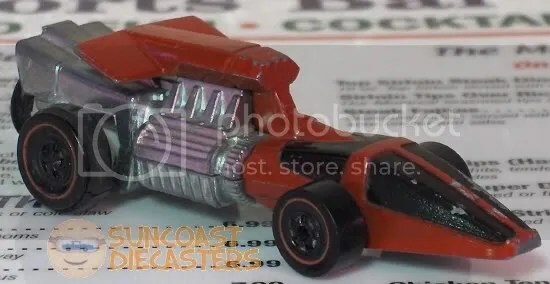 Mike C. did very well in acquiring this pair of Torino Sotckers which were available only in the Thrill Drivers Corkscrew racing set from 1977. He also did quite nicely with this Sunagon and Upfront 924, both in great condition. This is the only version of the 924 with the ski rack. 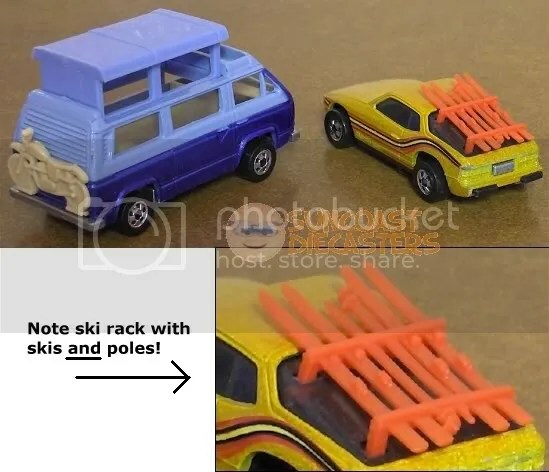 When I first staged the cars, I thought the rack was broken. Upon closer inspection (via eye loupe), I discovered that it’s actually molded to represent not only two pairs of skis but the poles as well! In fact, if you look closely at the inset, you’ll see that there are two “baskets&#34 on the poles — meaning that they’re actually pairs of poles! So, there are two sets of both skis and poles! Now, that’s detail! I think these belong to Ken, but he ain’t done e-mailed back to me yet, so for the time being they shall remain, er, “mystery cars”. UPDATE: Yes, these are Ken’s; (L) a Corgi Juniors Jaguar E-Type “2+2”; (R) Majorette BMW 3.0CSi (@ 1/60). 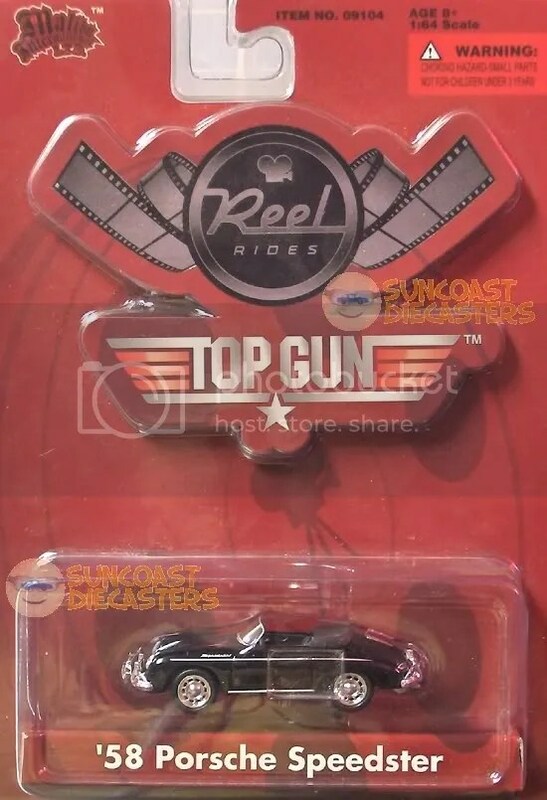 By the way, the Jag is more specifically part of Corgi’s Growlers series, which features a “noise-maker” mechanism meant to simulate engine noise. It’s not fantastic, but it’s a nice reminder that toys didn’t always have microchips and digitially-stored audio. (Ditto.) [Well, I can tell you that the blue-&-fins is Al’s Custom Cruiser from Toy Story 2.] 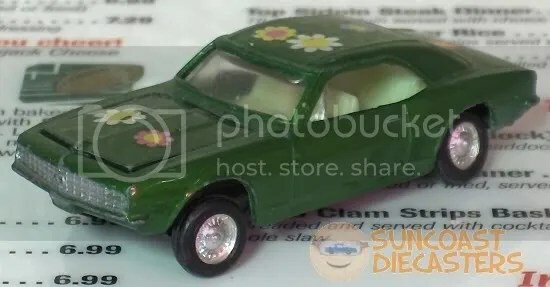 UPDATE: Yes, these are also Ken’s; the red is a Road Champs Datsun 280ZX, and the green is a Zylmex Datsun pickup — from the front end, I’m guessing an early ’70s. Now these are definitely Ken’s. I think. 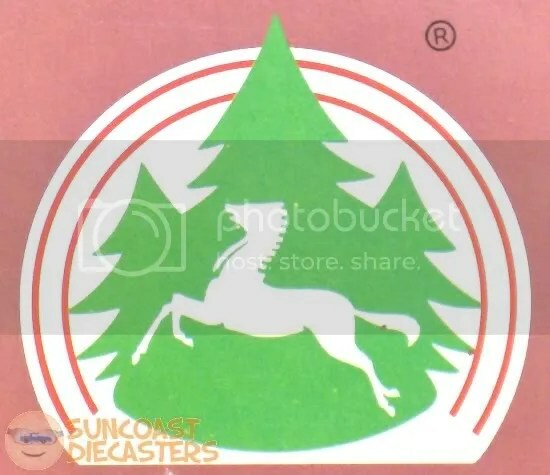 Anyway, Jeremy pointed out that the logo on the “Federal Delivery” school bu- er, dairy va- er, truck looks suspiciously similar to Summer’s “leaping gazelle” logo. I enlarged it in the inset for your convenience. And in case you’re wondering what’s inside the Porsche — well, duh, it’s its inerior. Its flat, cardboard interior. Seen from above, it seems to show a bucket seat, center console and … something else. And of all the weird notions we’ve seen in el cheapo no-name brands, a 2D cardboard interior has to be the weirdest. UPDATE: Yes, these are also also Ken’s. And much to my chagrin, Big Tractor Mike advised me that the Porsche is a Jaguar. Duh. 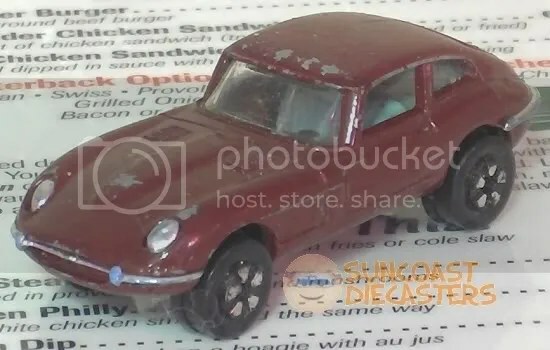 More specifically, it’s a Marx Jag @ 1/72 (according to this page). 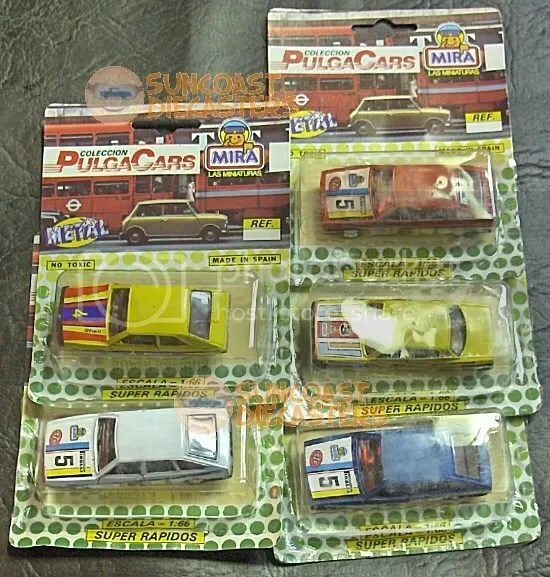 Desde Mira – Las Miniaturas: Colleccion del PulgaCars es muj super rapidos! Ah, nothin’ like some mostly fake Spanish to introduce more of Ken’s international collection! 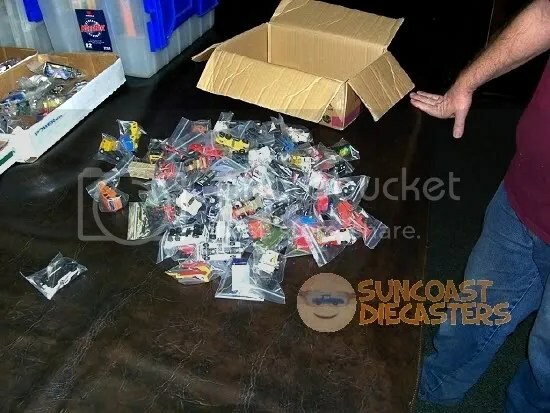 Of course, it just wouldn’t be a Suncoast Diecasters meeting if Ken didn’t find a couple more Willys models. 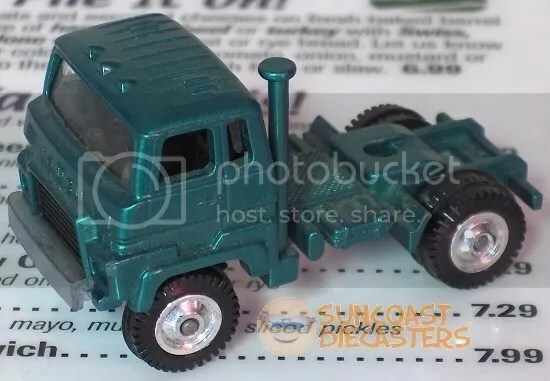 Or, for that matter, a couple more garbage trucks. (That Asian one on the left has some very nice articulation on the hopper; I regret not taking photos of it. Oh, well.) By the way, how the heck does Ken keep finding these things? Good ol’ Ed showed up, which is a treat in itself, and he also brought a nice and numerous variety of cars with him. 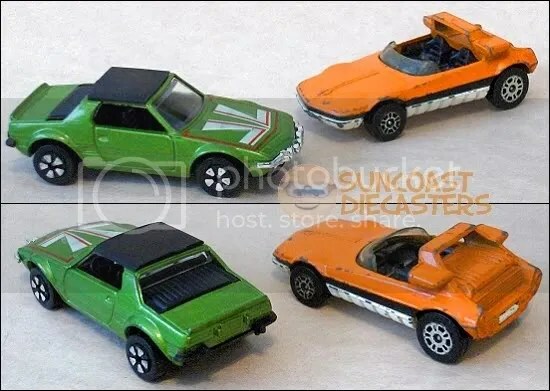 From him I acquired, starting top left: Police Cruiser (HW), The Demon (HW), De Tomaso Pantera (MB) and Silver Streak (MB). Thanks, Ed! 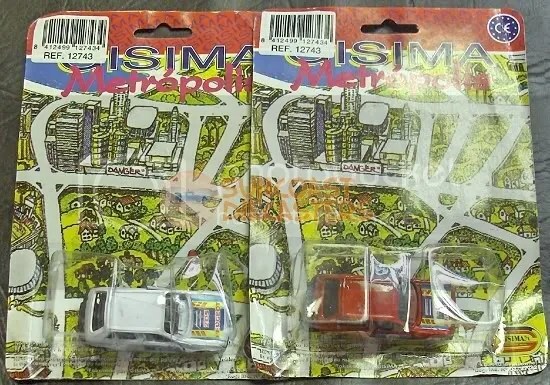 Yep, two more Kenner Fast 111s, courtesy Bill. He mentioned them at one meeting, then I had to miss the next meeting, then he forgot them at the next next meeting, so I finally acquired them at the next next next meeting. Now, sentence-diagram that for me. Spoiler Sport and defrocked Heavyweight, acquired for eventual customization. You know, eventually. Yep, another rare and great Zylmex find. That alone was enough to close the deal. But the “Wheaties” designation? — that was intriguing! 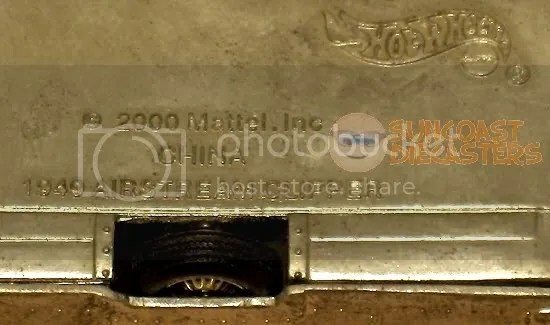 ‘Net searches turn up some photos of the van with tampos that inlcude not only the Wheaties name but also those of sports manufacturers such as Voit. Oddly enough, there are also numerous photos of the van with “’70s-era” bold striping, in the form of adhesive stickers (often seen peeling off the van), yet the van is still marketed as a Wheaties-related item, as seen in this catalog page. I suspect the version with the Wheaties tampos was a cereal box premium, but I’ve found no data to support that. Thank the Lord for the Super-Macro setting! My attempts at photographing the chassis of the Zylmex Wheaties van at the Sports Bar just wouldn’t pan out, so at home I used the set-up below to shoot the photo above. And where did I get the groovy micro-tripod? At Dollar Tree. 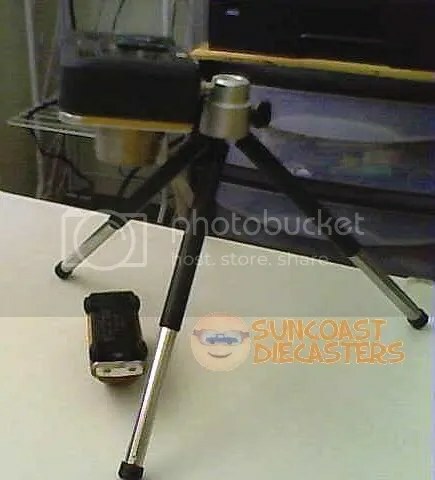 Yep, you’re looking at a $200 digital camera mounted on a $1 tripod. Why? Because I’m just that stupid adventurous! Who ya gonna call? Ken, because this is his now. Kenny got into some serious old-timey metal here, including a vintage tin-type with a gorgeous red, white & blue paint scheme. WIN! 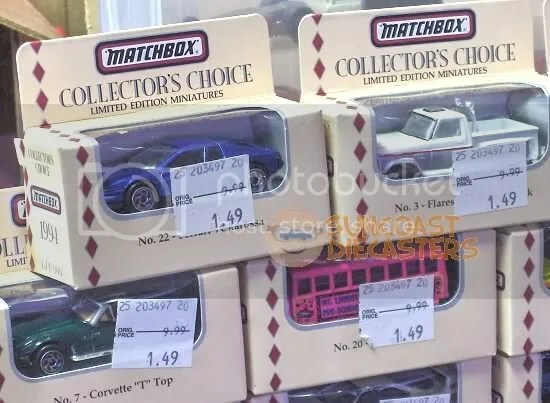 Ken has acquired an entire 24-car set of the 1994 Matchbox Collector’s Choice collection. 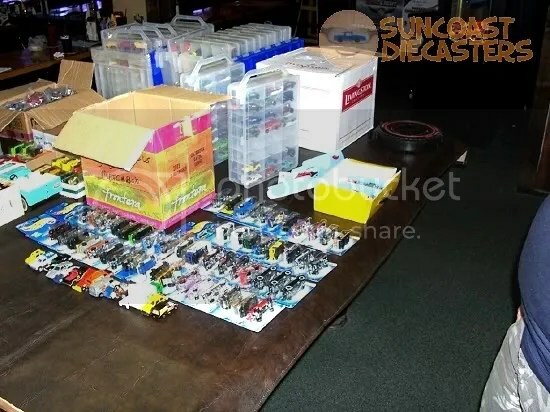 And he’s selling the entire set. No ausgepärten allowed here. Some detail of the set, just to be nice. 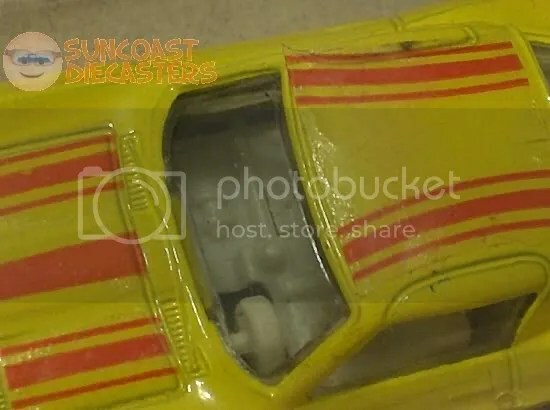 Bob joined us, and from him I snagged another pair o’ Kenner Fast111s. Also nabbed the MB Clipper from Big Tractor Mike. It’s a Rolamatics, and the exhaustules mostly work. WIN! …I think I found me a new chat-room avatar! Way-cool display case, courtesy Ken. It seems to be primarily scaled for 1/43s, but I only had one with me, so I tossed a couple o’ 1/64s to fill it out. 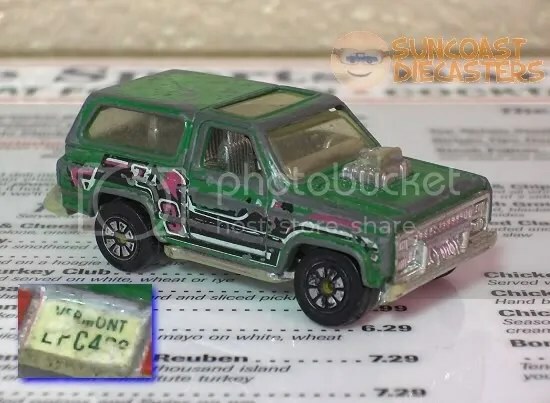 By the way, the 1/43 is a Matchbox Super Kings Plymouth Gran Fury, dressed as NYPD, courtesy Bob. A few dings & dents, but the doors and trunk still work, and overall it still looks pretty sweet. 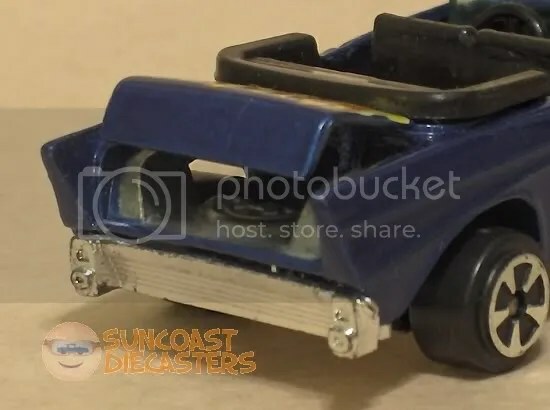 As stated in the previous update, Your Humble Webmaster was unable to attend the May meeting of Suncoast Diecasters due a family get-together thing. So, Big Tractor Mike courteously took some shots and sended them for use here in the Gallery. (Actually, several are from the April meeting, but since I’d already updated the Gallery for April, I decided to just lump ’em all here in the May entry. And what are you gonna do about it, Mr. Space-Time Continuum? Yeah, that’s right, nothin’, pal!) It was very thoughtful of Mike to … uh … yeah, that’s fine, Ken; go ahead and just dump those anywhere…. 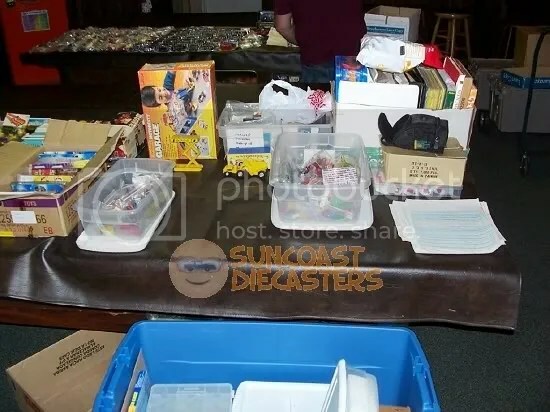 Well, unfortunately I forgot to bring my camera to the April meeting, so none of the fine trades were photographed in situ. 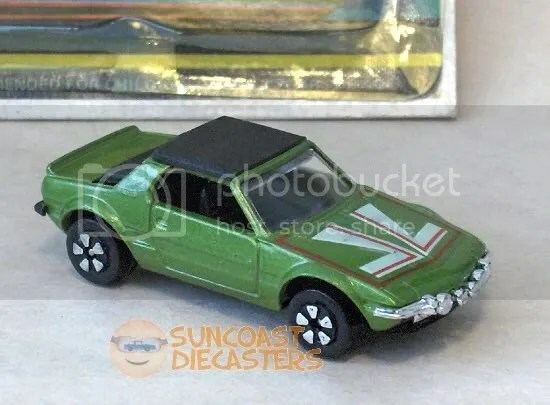 So, here are some when I got home shots of the one new car I bought: a Fiat X1/9 by PlayArt, sold under the Peelers brand. 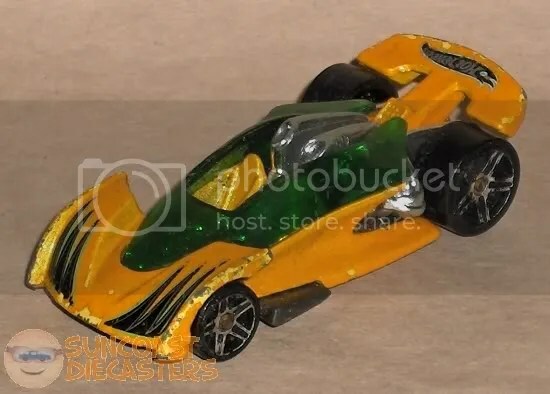 Yeah, the wheels are clunky, but overall it’s a nice casting. And I like the “road rally” array of lights. As I’ve said before, I (ahem) generally don’t buy Euro-sportsters. So, why did I buy this one…? This is why: the Fiat X1/9 is the production version of the Bertone Runabout. It took me some recalling (not to mention actually checking online via BTM’s laptop via the Sports Bar’s wifi link), but I verified that this one was what that one was before they made it into this one. So, for history’s sake, I acquired it just so’s I could provide you with these after ‘n’ before photos. Enjoy! If you’ve been to Dollar Tree recently, you’ve probably seen these innocuous fellows hanging around. No indication on the cardboard who really makes ’em; just the Greenbrier (i.e., Dollar Tree) callout. 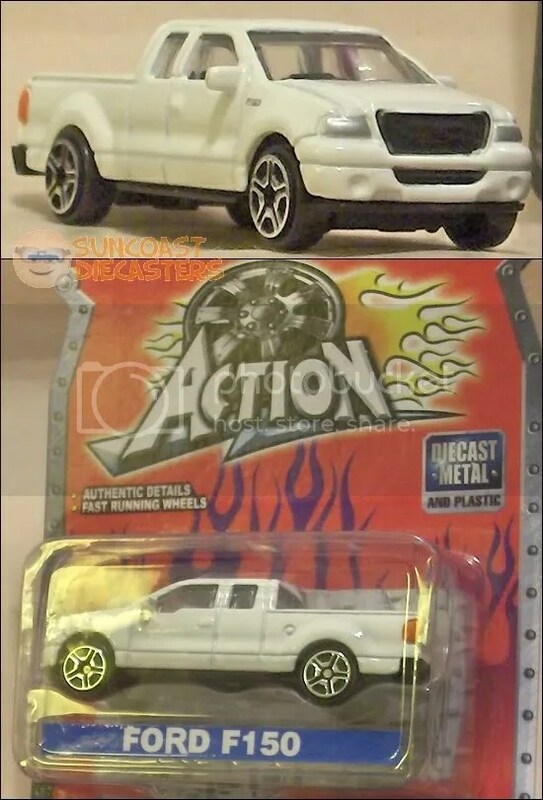 Note that the brand doesn’t say Action Wheels or Action Vehicles — heck, it doesn’t even have an exclamation point — just plain old “Action”. 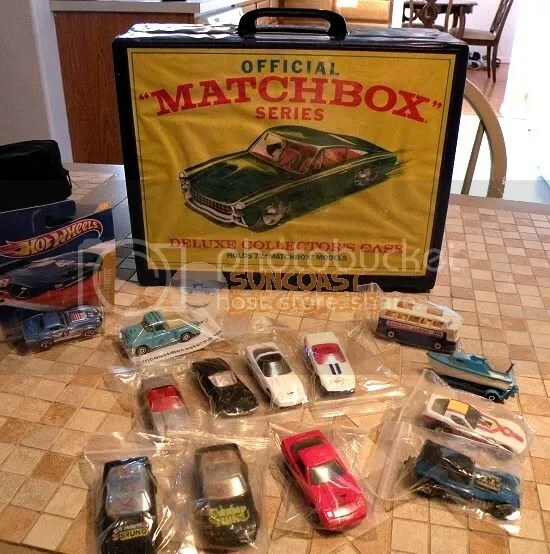 Pretty dull selection, too, IMHO; no custom hot rods or early/mid-century classics, just a small assortment of late-model everyday cars. I picked up two Ford F-150s to bring to the April meeting, just to see if anyone would bite. Why the F-150? Because it was the least-boring of the available models. In the end, no-one bought ’em, so I popped one open to scour it an eye-loupe — nope, no branding. (Does have nice F-150 tampoes in front of the side mirrors, ‘tho.) Ken, having also seen these at $Tree, thinks they’re Summer, based on the wheels. 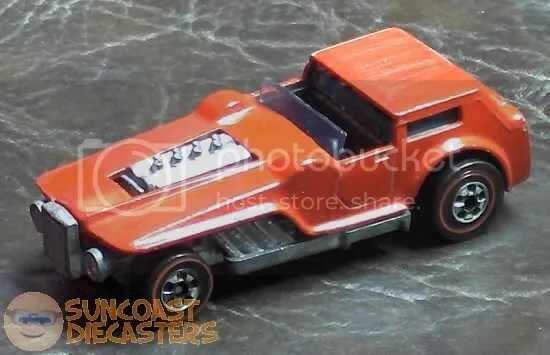 So, I’ll keep the other one on the card, because this is very likely my only chance to own an “MOC” Summer. 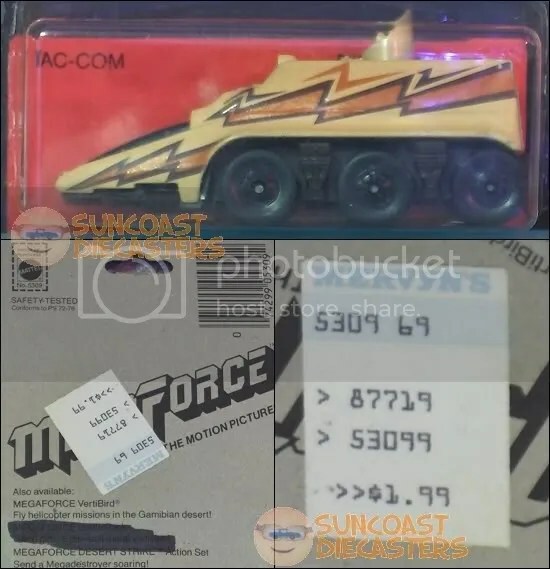 This is simply amazing: Bill actually has obtained an original MegaForce TAC-CON in its original packaging. For another drool-inducing photo, check out the full shot in his gallery. But in the mean- time, dig the groovy original Mervyn’s price sticker. If it’s not garbage tucks, it’s Willees … Willyses … Willyoii … well, anyway, Ken is seriously into Willys models. Below is the Phil’s Garage-seies ’41. 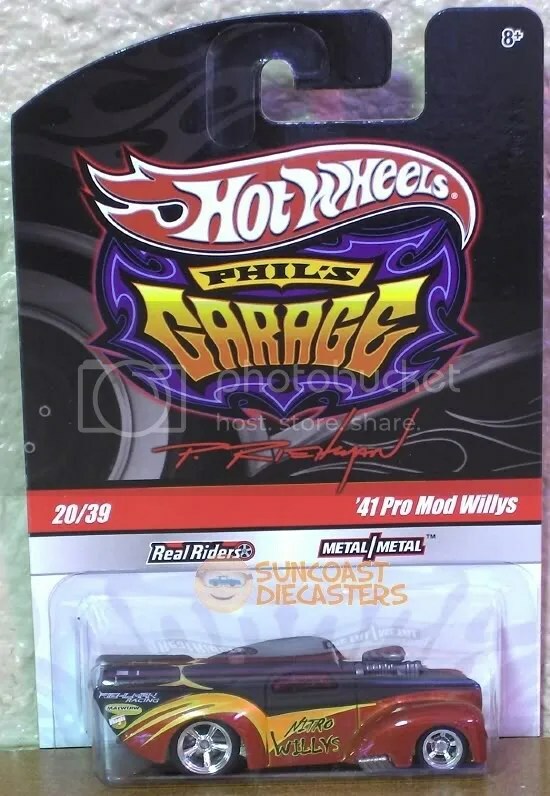 Yes, Hot Wheels has expanded the …‘s Garage line to include others’ garageses. 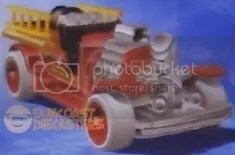 Not certain, but I suspect it’s a retool. Seems more sharply-defined than the regular line model, and the grill is different. Nice paint, and dig them sweet wheels! More Ken-stuff. 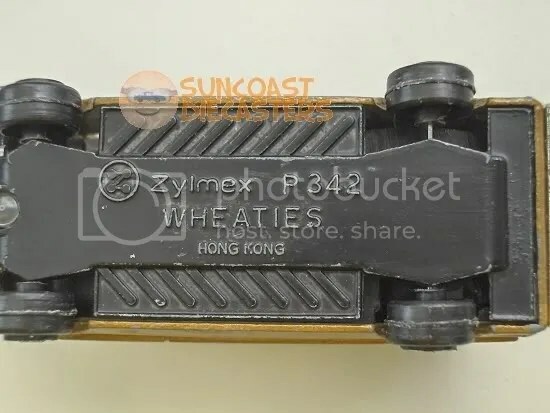 The Checkerboard Feed is IMEX / Golden Wheel #87018 (again, another brand I hadn’t heard of before joining Suncoast Diecasters). 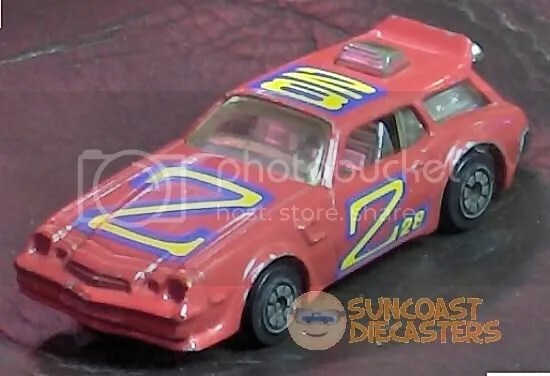 Kenner Fast111s Outlawer, from Marge. 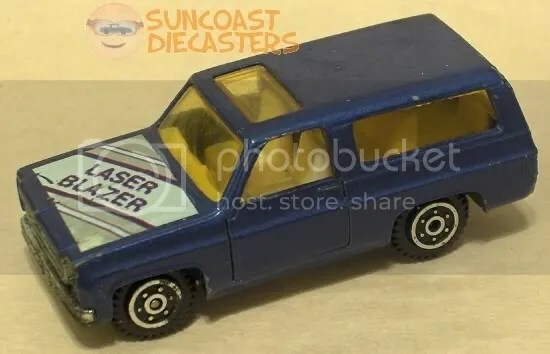 I already have at least two of these, but since rediscovering Fast111s thanks to Suncoast Diecasters, I collects ’em when I can! Jeff of the MCCH stopped by with just ooh-gobs of wonderful goodies. 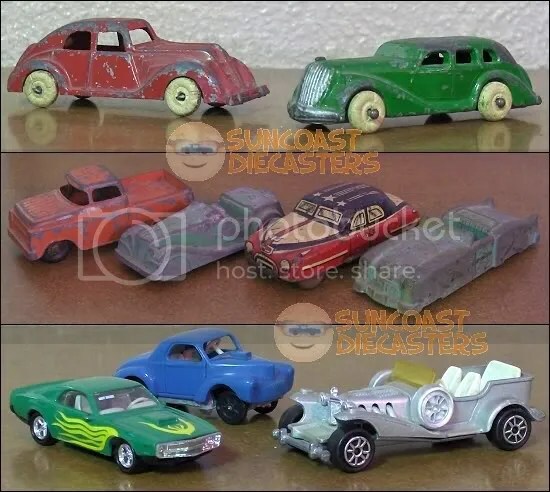 On the left is a pristine Open Road-ster, the same model that Ken gave to me as a RAOK in January (BTW, the one Ken gave me is in a protect-o-shell, in my Big Display Cabinet). On the right is Chop Suey, one of a trio of wildy- customized choppers. 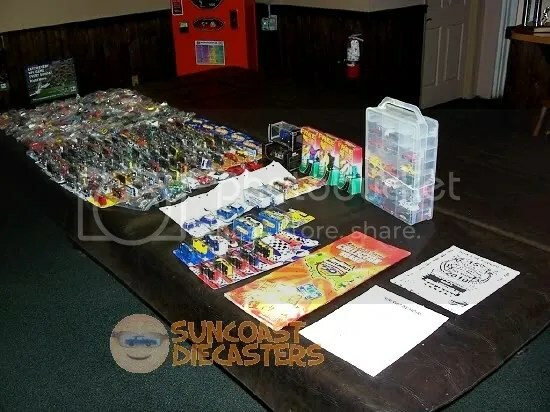 I acquired Jumbo Jet and The Stingeroo last year; now, thanks to Jeff, I gots the whole set! And the tooler in the back is Super Coupe, yet another Fast111s model — thank, Jeff! Big Tractor Mike starts the Feb meeting off nicely for me with this great-looking Kenner Fast111s funny car. Great condition and, as you can see in the inset at lower right, a sharply clear license plate. I like the body shell’s cutout for the engine; instead of a simple square, it follows the geometry of the block. Tom snagged yet another variation of the 181. Man, those bright neon colors are fryin’ my eyes! Actually, these are from some ‘dark’ series by some manufacturer (can you tell I need Jeremy’s input on these?). Jeremy also snagged this hot ’71 Demon. Now, c’mon, I should get an award or something for this classy shot! From the Ken Kollection. Notice there’s no “800” number to go along with the “How’s my driving?” callout? They probably learned the Larry Wood lesson about putting phone numbers on vehicles. How does he keep finding them? Wow… Ken really knows how to start a fellow collector’s year off on the right foot! Our January meeting had hardly started when he RAOKs me with this Open Road-ster. 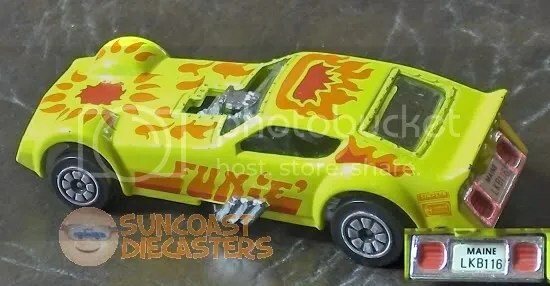 He apologized more than necessary for the car’s rough condition; I explained that I hadn’t even heard of this model until I happened to spot it in the Hot Wheels Wiki listing. 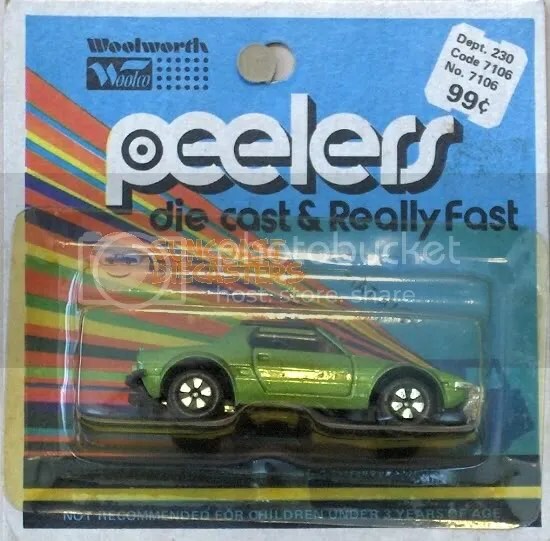 Somehow I completely missed this one on the pegs, and I figured it’d forever one of those models I only see in someone else’s collection. Now, thanks to Ken’s kindness, I gots one of my very own! An All Points Bulletin went out after Bill picked up this Hood Hiway Robber. Mike C. jumped on these Jeep variations, including later throwing some new white-letter tires on the one in the background. Ken scored nicely with this Corvair. 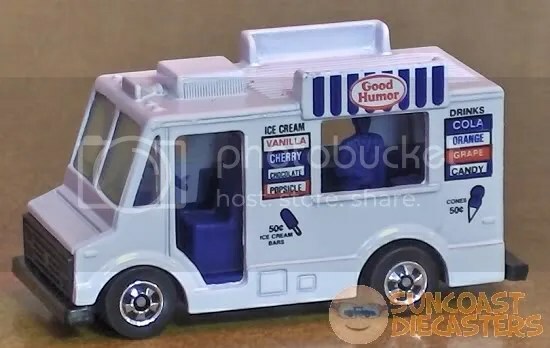 Ken scored very, very nicely with this Good Humor Truck. Don’t know if it’s the Hong Kong or Malaysia version, but I do know that it’s the very rare version with both “Good Humor” and “Popsicle” on it. Complimentary drool cups are available in the lobby. As I was setting the car up for the above shot, I noticed that it seemed to have a reasonably detailed interior, so I decided that after taking that shot, just for fun I’d try to get a good pic of the interior. As I repositioned it, trying to determine the best view, I noticed something odd: it didn’t seem to have a passenger seat. Odd, but not too unlikely, I thought. After all, I have a Summer 4-door sedan with no rear interior. But I realized that while there wasn’t a passenger seat, there was detail of some sort. An eye loupe revealed ribs or ridges, looking like a frame of some sort. More surprisingly, just ahead and to the right of the gearshift, there’s a cylinder-shaped object strapped or bolted to the floorboard. A fire extinguisher? ; a NOS tank? Seems this no-namer wants to make a name for itself in the quarter mile! Also, other intriguing details I didn’t notice until I was preparing this photo for the Gallery (thank the Lord for hi-rez digital photography! 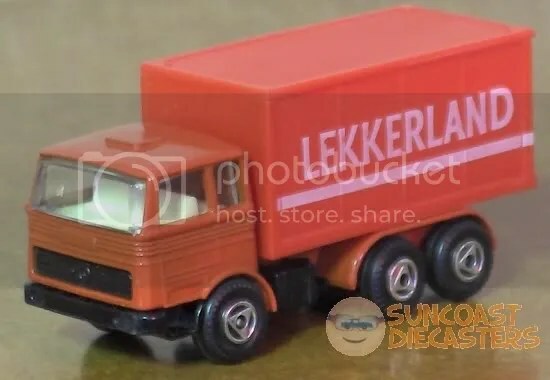 ): the tampos might only be modest decals or adhesive stickers (note the passenger front corner of the roof). Yet, there are vents and wipers molded on the body … and there’s even a rear-view mirror molded into the windshield! 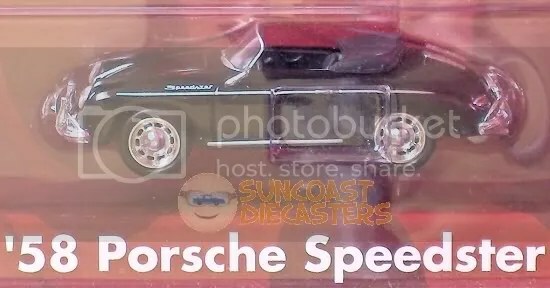 So, this is a very intriguing model: a combination of low-quality wheels and decals, with thoughtful body details and an interior which clearly implies timed races. I’m suspecting Summer, Yatming, maybe Zylmex, possibly Playart. But, as the old Tootsie Pop commercial said, “The world may never know”, because this is the only one of its kind Margie had, and it’s staying in its package, as long as this Steve has anything to say about it! Mikey done a bad bad thing.Didn’t I just mention buying store-branded cars? 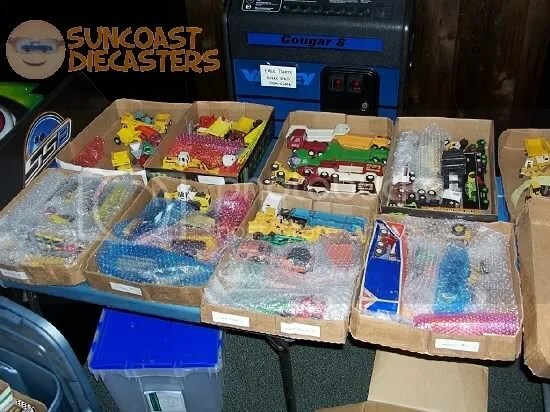 Actually, Big Tractor Mike done a very good thing, when he bought up a huge chunk of Margie’s collection, thereby ensuring (in some way or another) that the cars stay safely in Suncoast Diecasters hands. (Mike’s pretty smart that way.) 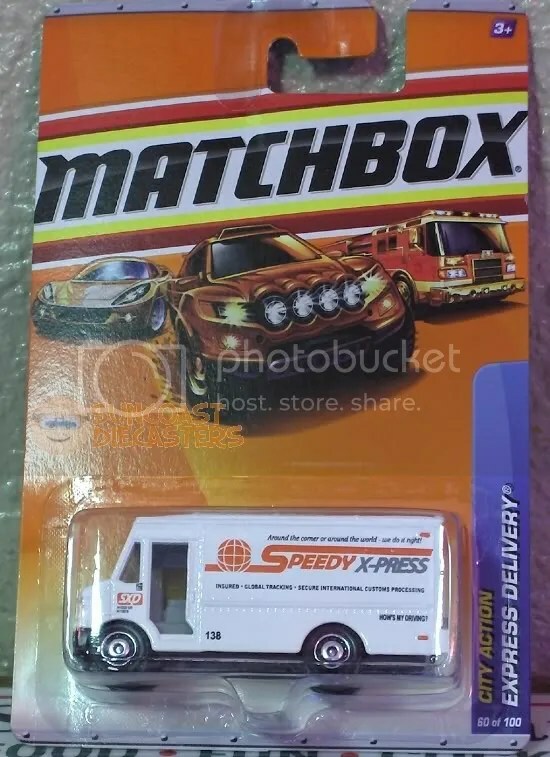 Several of the models were duplicates, which gave me this fine opportunity to keep a store-branded model untouched in its package while also adding to my collection of (yes, Ken) funkified vans. However, my main interest is the Woolworth / Woolco branding. Many, many times did my parents & I shop at these stores. Unfortunately, I’ve now realized that I really don’t have any specific memories from there, just the generic one of recalling that we did shop there — with the possible exception of checking out “Ben Cooper”-brand Halloween costumes (but then, those were everywhere when I was a kid so, again, not specifically a W/W memory). 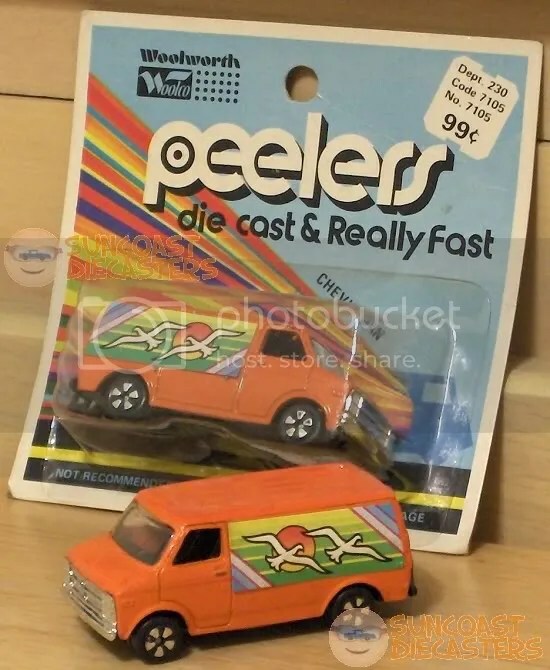 I presume Peelers refers to high-powered vehicles “peeling out” in rapid acceleration (for me, it means peeling that dorky seabird sticker [and it is a sticker] off the van. But I won’t). By the way, the model’s actually a Playart. 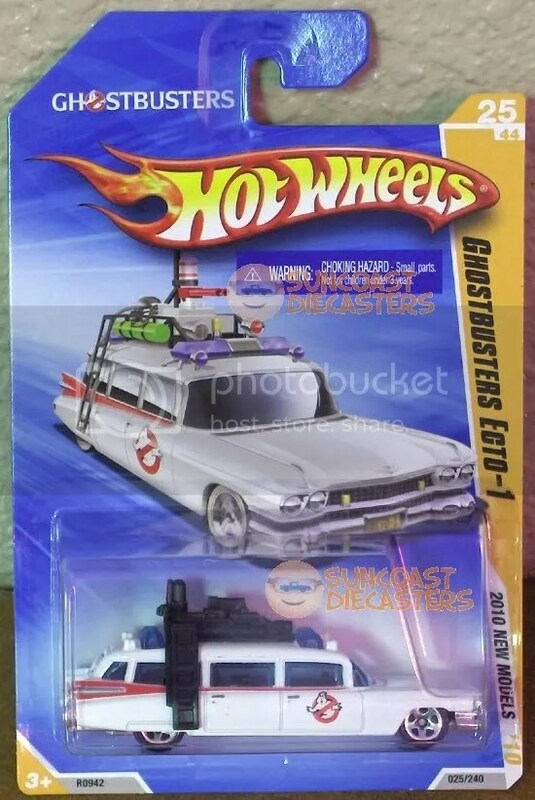 Wheels are kinda cheezy, but overall it’s a pretty decent casting.